Betty Marsh (Mary Russell) has assembled a group of archeologists to go look for her father who disappeared three months ago while searching for the lost city of Luckachakai. In ride our heroes, The Three Mesquiteers: Stony Brooke (Robert Livingston), Tucsan Smith (Ray Corrigan), and Lullaby Joslin (Max Terhune). They bring with them one of the people from Professor Marsh’s missing group. He’s dehydrated and incoherent, but tells Betty she needs to find her father before he’s tortured by a cult. He’s silenced by a knife in the back that bears an ancient Indian curse. He also has a treasure map. The group sets out to find the lost city of gold. 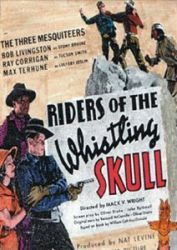 Riders of the Whistling Skull is a mix of several genres, it’s a western, an adventure film, a horror movie, and a cornball comedy. I was a little worried when one of the Mesquiteers brought out a ventriloquist dummy early on, but the fact that they paid that scene off later in the film is a tribute to how well it’s written. There is definite tension when the group finds themselves stranded in Indian Territory with an enemy who can pick them off one by one. The cultists are represented as only shadows as the attack the party. The cult behind it all engages in torture and branding, and seems to have a few living mummies at its disposal. Riders of the Whistling Skull never delves into subject matter that is too dark, but it does blend horror elements in well with the rest of its mix.